“It has been an absolute pleasure to be your guests. You have taken great care of us, with pride and perfection in every single thing. Your beautiful nature and attention are apparent in every detail at Rose Court Cottage.” Comment in our Guestbook……. Great little cottage, a perfect gem with lots of fun details and touches, great hospitality and a friendly, helpful host. All we could want in an accommodation. 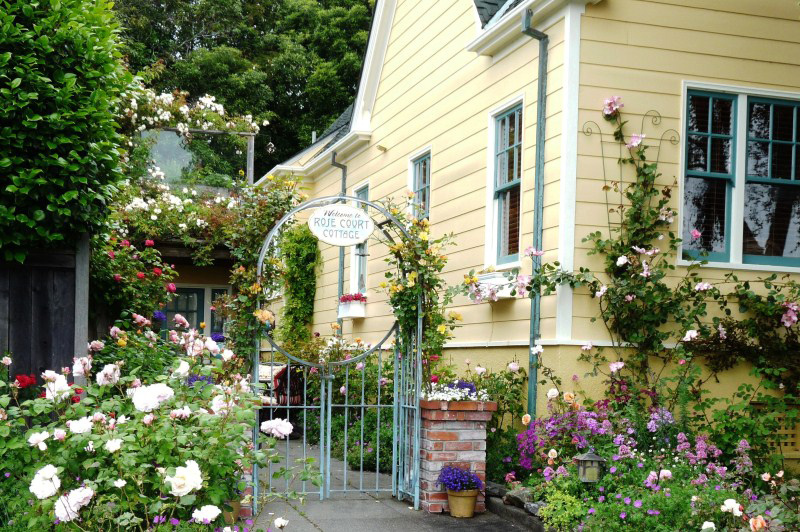 The cottage is private and very quiet, and the entry courtyard is filled with roses, a fountain, and beautiful plantings.” Five Star guest review on VRBO.com……. The owner, Christy and Aldaron Laird, have lovingly renovated their Tudor-revival home inside and out and landscaped it in the English cottage garden style. Their residence was featured on Home and Garden Television’s Old Homes Restored program in 2002, has been a garden tour favorite of the Humboldt Botanical Garden Society on three occasions since 1997, and was featured on the Historical Sites Society of Arcata Home Tour in 2008. Christy, the host, enjoys sharing her knowledge of the area and its finest attractions and hopes her attention to detail and service will enhance her guests’ travel experience, whether they are vacationing here, visiting family, the university or their HSU student, are here for business, or may be simply passing through. PLEASE NOTE: Single nights may be booked in some situations but are subject to Owner/Manager’s discretion.